« Walgreens Starting 3/15: FREE Nature Made VitaMelts 100 Count Print Coupons Now! 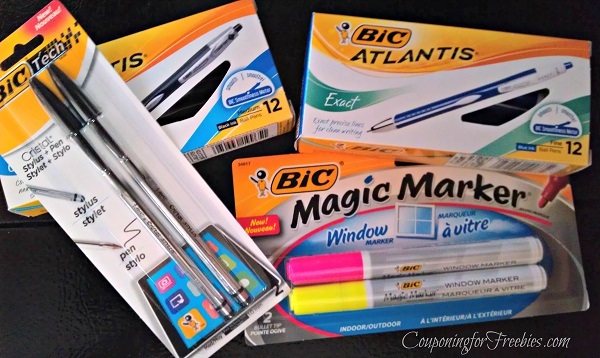 As I am sure many of you know by now that Bic is my go to brand for office supplies. So when ever I get a chance to try out some of their new products, I jump on it! Shoplet sent me four of the new Bic products to try and let you all know what I thought of them. First off, I never even knew that there was such a thing as a window marker!! Totally cool, Bic has done it again on another awesome product!! These work much like a dry erase marker. You can write on windows or mirrors. It is bright and easy to see. Plus after it drys (just a few min) you can wipe it off with a cloth very easy. The Atlantis pens are not only stylish to look at, they are smooth writing and feel comfortable in the hand. I love the idea of a pen and styles together. The Cristal pen works great as a styles and the pen is pretty good too. The one thing I wish was different on this pen is the top. I always lose caps to my pens. I wish they would have made this with a twist type pen at the end. But other then that, it works great. If you are in need of any Promotional Products, Medical Supplies or Office Stationary, be sure to check out Shoplet.com.